Antariksham 9000 Kmph (2018) An Indian satellite named Mihira goes out of control and it is on its way of colliding with other countries satellite which goes in a chain reaction and which in turn results for communication blackout throughout the world. To prevent this, Indian Space Center sends four people on a manned mission which include Dev (Varun Tej) who has a sad past with this own satellite Viprayaan. They successfully repair Mihira and prevent the damage and then Dev start taking his own decisions to fix Viprayaan which is out of the plan and they don’t even have the required specifications to do so. How Dev convinced all his other astronauts and accomplished his mission?. sceintifc thriller after a long years .a good movie visible on screen ,i feel ,varun tej action and story was good,director sankalp was written this ultimate story ver well ,story is indian sateilite was gone to universe and that was made some problem and got very ditsurbance to other countrys ,here varun and his team send to universe to sovle that how they solve and what they get some problems ,rest of the story watc on screen,back ground beezem and music also nice ,so nice sceintific thriller ,varun get a block buster . varun tej back with ANTARIKSHAM got super hit ,this time also movie was excellent and so nice to watch lot of information was got through this movie ,chldren are liked this story ,and family also ,varun tej and his team gone to repair the satelite and they got some problems and varun tej as past failure on this ,and he was worried so much , over all its an ultimate sceintific thriller on this year ending i glad to watch this good movie . ANTARISKHAM ,varun tej new movie ,he was jusding the story very well and getting sucess ,this time also he got back to back hits ,coming to movie its an pure sceintific and thriller ,director sankalp written and well directed also well ,music and cast visual effects make movie high way ,so all and all movie was super hit ,so go and watch on big screen . 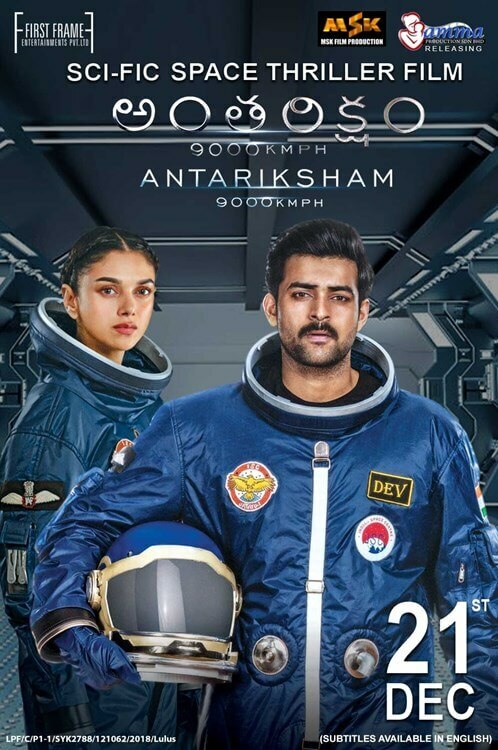 ANTARIKSHAM varun tej new movie ,from starting on wards he taking different storys and how ever he creates own image ,so this movie also be good and entertained to audience, sankalp reddy was written and created ,well this scientific movies are coming rare so all will excited to watch ,so go and watch on big screen. Antariksham' Has A Remarkable First Half And A Not-so-convincing Second Half. The Director Tells A Layered..
All In All, 'Antariksham' Can Be Termed As A Good Attempt In The Science Fiction Genre. A Better Screenplay..
Antariksham` As It Is Already Evident From The Promotional Content, Is Solely Based On Space Exploratory.. There Are Deliberate Attempts To Make It Appeal To The 'masses', But Nothing Is Convincing Enough To Make The..
Antariksham' Is First Ever Space Thriller In Telugu Cinema. Director Sankalp Reddy Has Given His Best To Tell.. Despite The Varun Tej Starrer Space Thriller Did Not Gripped Throughout But Definitely Gives An Unique..
Krrish With Antariksham Movie Team..
Antariksham 9000 Kmph Thanks Meet..
Antariksham 9000 KMPH Movie Team..
Varun Tej Exclusive Interview ||..
Antariksham 9000 KMPH Pre Release..
Varun Tej New Movie Launch |..